Today I'm perusing the menu again (yes a menu in Biz!) and using past experience opt for the pheasant terrine as entrees are always cold on BA. I learned that the hard way when I ordered seared scallops and they were stone cold. Not room temp, but fridge cold. Can you imagine anything more depressing? Well, probably, but when you have expectations that are so cruelly dashed, it strikes quite a blow. For my main course I opt for chicken breast. A safe choice I know, but faced with smoked salmon (dull), beef fillet (most likely not cooked how I enjoy) or the veggie dish, it was the only real option. And you know what, I was pleasantly surprised this time. The terrine was pretty chunky with decent flavour. The chicken breast was moist and tender (despite lacking visual appeal! ), but perhaps a bit heavy on the salt. That could have been the bread sauce or just my taste buds being out of whack at the altitude or as a result of too much St Emilion which went down well thank you very much. The stewardess obviously noted my appreciation of the wine, or perhaps just thought I was an alcoholic. Just before landing she poked her head around the corner of my pod and offered a bottle of pinot from Sonoma. It had been opened but hadn't been poured. So with a cork stuffed in it, I graciously accepted the bottle and thought of the relaxing glass ahead of me that evening. 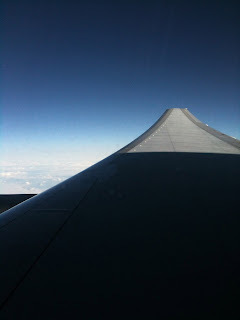 All in all, it was a pretty good flight and that's without mentioning the scones served as afternoon tea before landing. Oh that reminds me. I should tell you about the afternoon teas at the Bakkerswinkel from my days in Amsterdam. Best airline food I have eaten was a cheese sandwich. After a very long flight from San Francisco to Birmingham via Frankfurt (it was a work trip booked by a US-based travel agent) I suddenly and desperately longed for a cheese sandwich. And for lunch on the final leg of the journey? A real Cheddar cheese sandwich on granary bread with an onion chutney. It was so good I nearly cried with joy! Haha...sometimes the best meals are the simplest! That sounds great. I do love a good onion chutney I have to say. Yum.